I am personally using bluehost, not this particular blog. If you are going through online reviews and rating you can see mixed reviews about bluehost and their support. In my opinion bluehost shared hosting is always worth trying if your requirement is not too big. And in future you can try their vps/dedicated hosting plans if your requirements are quite big. Here we will discuss some advantages of using bluehost and also will help you to quickly create an account in bluehost with a small discount using our link. Read also : 5 minute WordPress installation in a bluehost Shared Hosting. Bluehost is known for their pricing, offerings and free domain for first year. Bluehost is a popular name for shared hosting services. They launched their service way back in 1996, which is quite long in terms of an internet based company. Now bluehost is part of famous EIG (Endurance International Group). Previously they were only providing shared hosting services which is considered as a disadvantage of their service. Recently bluehost introduced vps, cloud and dedicated hosting services. That should really help businesses to easily switch to better hosting when their business grows to higher levels. Here it is the list of features that company itself pointing out in their site. Bluehost have trained, in-house experts available to help 24/7. Their robust support center includes guides, video tutorials and more along with their 24/7 support. Bluehost provides a 30-day money back guaranty service which will help us to cancel and ask for money back in case of issues with their service. Bluehost is integrated with MOJO Marketplace which is providing an awesome one click script install service, making the web’s most popular resources instantly available in bluehost cpanel. You will also get free advertising offers from Google, Facebook, and other leading sites to help grow your business. For beginners bluehost offering a free domain to start business without spending a penny for domain. 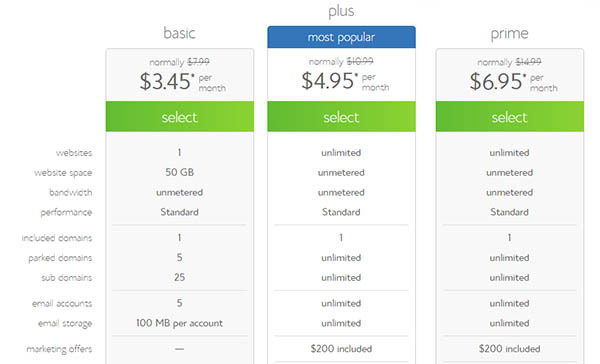 Bluehost pricing is very useful and reliable for beginners and start-ups. And bluehost shared hosting can handle more than 10k page views in a day with an optimized website. WordPress is one of the widely used cms(blogging platform now it is even used for creating ecommerce websites). Bluehost hosting is a prefect for bloggers who is starting with WordPress. Mojo marketplace one click script install is free to use along with bluehost hosting.